Each piece of jewelry is artfully created by me in my Greer, South Carolina home studio. I pride myself in using hand-selected gemstones and pearls, artisan-crafted lampwork glass beads, and quality findings in each and every piece. This listing is for your choice of tiny initial or alphabet charm that measures 7mm in diameter and approximately 1mm thick. It comes on a 5mm open jump ring. 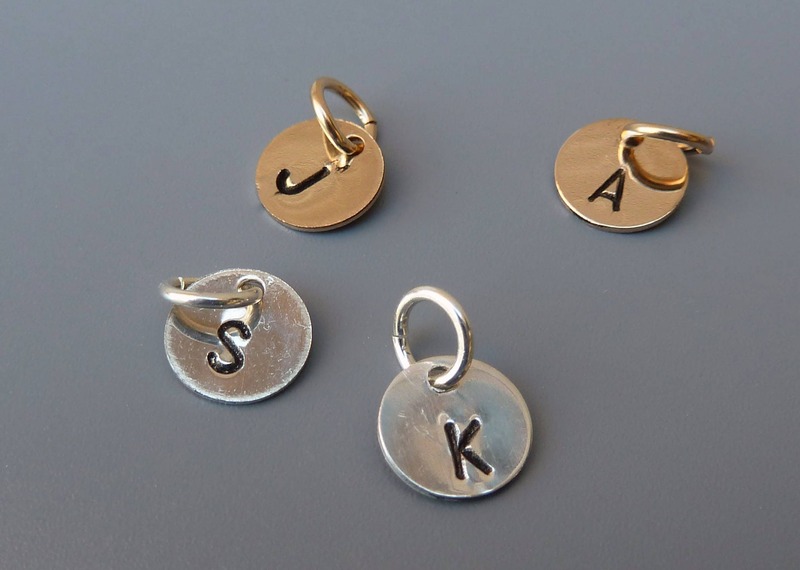 These round charms are hand stamped using block uppercase letter stamps with an impression that measure 3/32" or 2.4mm. The impression is darkened with a black enamel/acrylic marker pen. The charms come in either sterling silver or 14 gold filled. ***Please note that these charms are hand stamped by me and not machine stamped. So expect some slight imperfections in position of the letter on the charm. I try my best to center the letter but they may not be exact. That is the "charm" of having a hand created piece (pun intended!). Thank you! Note: Shipping costs are listed for US and Canada only via USPS first class mail without insurance. If you would like to insure your package or would prefer Priority mail, please convo me before you make your purchase so that I can apply the appropriate shipping charges to the listing before you make your purchase. If for some reason, your purchase breaks within the first year, I will repair it at no charge and pay the shipping both ways. Please convo me for instructions and to be sure your piece is eligible for this warranty. Arrived so quickly and was exactly what the picture showed!! Perfect! Will be perfect as a gift!